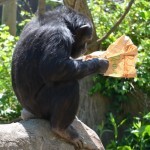 The chimpanzees celebrate Earth Day 2015. They are given bags with popcorn and celery. A Komodo Dragon gets some animal enrichment at the St. Louis Zoo. Treats of mice and fish are buried in newspaper inside of cardboard boxes.